Summary: This report looks at ways in which college freshmen interpreted and negotiated an assignment calling for writing based on reading, along with how teachers then judged the abilities and preparation of the students based on that writing. The study discovered that students and teachers had different understandings of the expectations of the task and that such tasks are more difficult and complex for students than teachers realize. Although an older article, the conclusions of this research are still relevant in understanding the difficult transition from high school writing to college academic discourse. This article would be a useful starting point for discussions of how teachers must examine their assumptions about students’ interpretations of assignments. In addition, it might serve as a model of inquiry into the writing process of students. When we tried to place the essays on a continuum of idea-transformation, from those which summarize (tell ideas) to those which transform for an original rhetorical purpose (transform and use ideas), we found a group of essays in the middle of the continuum in which structural signals did not match the treatment of ideas. We found, for instance, apparent summaries sprinkled with comments and evaluations of the source text, arranged in an implied chronological order. We also found texts in which unrelated pieces of source material were arranged as a list and presented with other cues that were apparently meant to suggest a logical sequence. 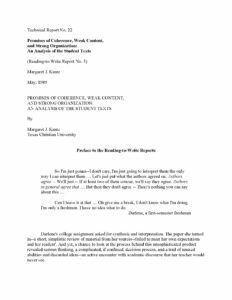 These oddly linked summaries were often framed in the introduction and conclusion by a larger idea that had an implicit topical relationship to the essay content but that did not in any way control the discussion or presentation of the content. These mismatched textual signals made it very difficult for the raters to decide what approach to the task the writers had been trying to use. Are You Ready for College Writing?